I think everyone had come to the conclusion that either Miller's or Country Seat had made a boo-boo. A couple of these jugs have just popped up on eBay too. Hi - it only looks deep amber because of the poor lighting. 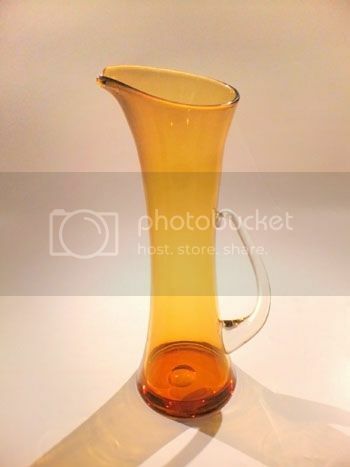 The photo of the gold/amber jug on the last thread was of the same jug. But I blame Tinypic for causing this confusion by randomly deleting half of their hosted photographs! 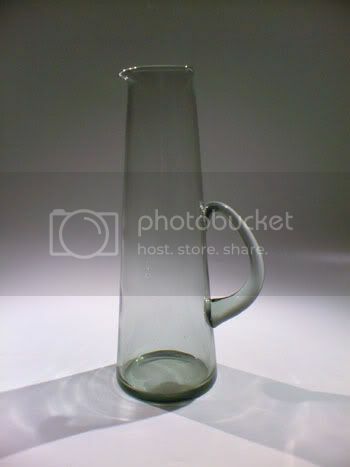 This is true, but it's closer in similarity to this labelled Holmegaard jug - I just can't decide if they're the same, though, taking into account the differences you get with hand-blown glass. 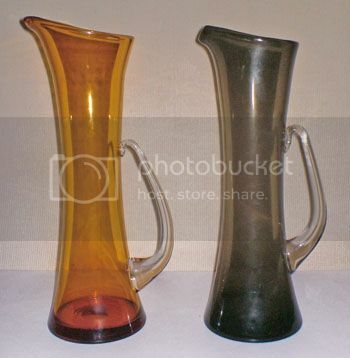 When I view my jug from the same angle as the labeled jug is taken from, they're more or less the same, except the opening on mine is slightly more narrow and the handle slightly less pronounced. But the smoked one is exactly the same shade as my Holmegaard Aristocrat decanter. The handle is flatter on mine and the top slopes slightly, yours look level across the top, yes?